Here are ten of the biggest current bargain contracts in the NBA. A bargain contract can go a long way in the NBA. By signing smart, team-friendly deals, organizations can allocate savings elsewhere to build a quality roster. Some of those bargain deals have been massive coups for teams and provided tremendous returns on investment. Not including rookie scale deals or max contract extensions, here are the ten current best contracts in the NBA. Following a nine-game audition with Minnesota at the end of the 2017-18 season, Rose inked a one-year deal to rebuild his value. The former MVP has been solid for the Timberwolves, averaging 18.0 points in 51 games. The 30-year-old looked rejuvenated to start the season under former coach Tom Thibodeau and looked like a possible Sixth Man of the Year candidate. However, after shooting better than 40 percent from three before the All-Star break, Rose has shot a putrid 7.1 percent in 10 games since. Still, for $2.2 million, Minnesota got a bargain. Since getting traded to Oklahoma from Philadelphia in 2016, Grant has become a seriously underrated key contributor for the Thunder. At 25, Grant has evolved into an above average three-point shooter, who can score in the paint, rebound, and block shots. He is lean, springy and unafraid to take on bigger players as a perfect small ball forward. Grant doesn’t need a lot of shots alongside Russell Westbrook and Paul George, but manages to make an impact with his effort and athleticism. With an average annual value of $9 million per season, Grant provides plenty of bang for the Thunder’s buck. Injuries have slowed down Noel’s career, but the sixth overall pick in the 2016 draft signed a mega cheapo one-year flier with the Thunder and has turned in a fine season. Despite playing under fifteen minutes per game behind center Steven Adams, Noel has been one of the better backups in the league, averaging 5.0 points, 4.5 rebounds and 1.3 blocks in 66 games. Offensively, he is average at best, but as an athletic, high energy defender off the bench, he is perfect for OKC. Lowered expectations have brought the best out in Noel. Dinwiddie’s old contract would have ranked at the top of this list after Brooklyn poached the talented guard from the G League. But, even with a freshly signed deal, the 25-year-old is still a bargain. In 58 games, Dinwiddie is averaging a career-best 17.5 points, shooting 45 percent from the field. After starting a majority of games for Brooklyn last season, Dinwiddie has stepped seamlessly into a bench role for the surprise playoff contending Nets. He has been incredibly clutch. Hard work paid off for Dinwiddie, who should more than double his average annual value with his next contract. After bouncing around the G League and NBA, House Jr. earned a two-way contract with the Rockets. After outperforming all expectations and cracking the starting lineup, the sharpshooter went back to the G League after failing to reach a contract with the team. House Jr. betting on himself and heading back to the minors forced GM Daryl Morey to guarantee his contract a couple of months later. On the season, House Jr. is averaging 9.6 points per game, while shooting 40.5 percent from beyond the arc and playing quality defense for Houston. He’s an integral player on a championship-contending team. Not bad for a guy who is earning $325K on his new deal. It has been a tough season for Covington, who was traded in November and has been out since New Year’s Eve with a bone bruise. However, that doesn’t take away from his deal being extremely team-friendly. Covington’s fantastic contract checks in at roughly $12 million per season until 2021-22. When healthy, Covington is one of the best defenders in the NBA. The small forward is active, can switch multiple positions, and causes fits for opposing offensive players. On offense, Covington is an above-average three-point shooter and scorer. His elite defense and shooting make him the kind of player every team wants. It safe to say Randle rebuilt his value the most out of any player on this list. This summer, the former Lakers lottery pick was let go by the Lakers in a cost-cutting move. Randle landed in the perfect situation in New Orleans alongside former Kentucky Wildcats teammate Anthony Davis. While the Pelicans’ season has largely been a disaster, Randle has been stellar. In 65 games (45 starts) Randle is averaging a career-best 21.1 points along with 8.8 rebounds and 3.1 assists per game. He has shown to be a quality scorer, passer, and rebounder. It is the kind of production L.A. could have desperately used. By taking a shorter deal, Randle is setting himself up nicely in free agency. Drafted in the second round of the 2015 NBA Draft, Richardson has morphed from a consistent third or fourth option in Miami into the team’s top scorer. In his fourth year with the Heat, Richardson leads the team with 16.9 points with 4.0 rebounds, 3.0 assists and 2.0 steals per game while shooting 36 percent from deep. He is a tenacious defender who brings it every night. Richardson is capable of taking on the best guards in the league. The Heat made a small bet on Richardson and have been generously rewarded. His 10.8 million AAV over the next three seasons is significantly below what Miami would have to pay for him now. In his 14th NBA season, Lou Williams hasn’t taken a step back. Instead, he has aged like fine wine. After scoring a career-high 22.6 points per game in 2017-18, the 32-year-old is still filling up the bucket with the best of them, averaging 20.4 points per game despite seeing six fewer minutes per game off the bench for the playoff-bound Clippers. Williams is likely to win his second consecutive (and third in total) Sixth Man of the Year Award, and deservedly so. Doc Rivers did not make many good moves during his management career in L.A., but signing Williams up at just $8 million per season was one of his best decisions. He’s massively underpaid for the production he provides on a nightly basis. Walker is an elite point guard and one of the twenty best players in the NBA, yet he is getting paid like a team’s fourth option. In his eighth season in Charlotte, Walker is doing it all, averaging an eye-popping career-high 25.0 points along with 5.7 assists and 4.3 rebounds. He’s played at an MVP level all season. The Hornets are two games back of Miami for the eighth seed in the Eastern Conference. Without Walker, they are without question at the bottom of the league. Walker signed the extension out of his rookie deal. 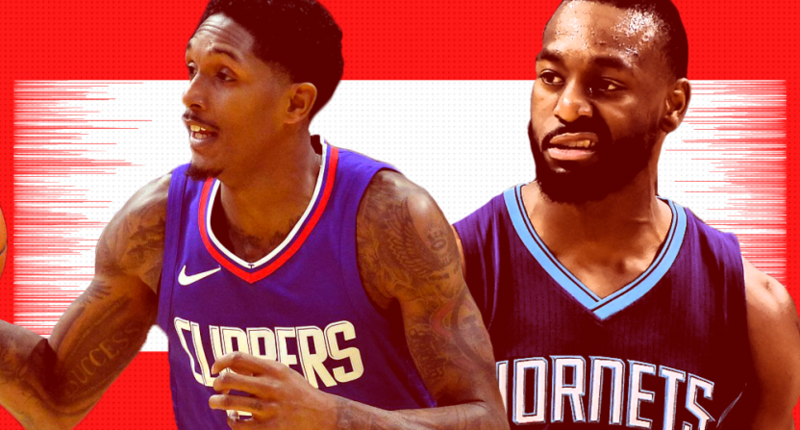 It has been the league’s best contract since nearly the minute it was signed, and it’s a damn shame Charlotte hasn’t been able to use those savings to build a competent team around him. Walker is set to become a free agent and is going to get a lot of money from the Hornets or another team with deep pockets.